Park rangers in Russia’s Far East witnessed their very own dancing bear, who has become an internet sensation over the last few days. The large mammal became rather attached to a birch tree and started to use it as the perfect scratching post. Researchers at the ‘Land of the Leopard’ park in Primorsky Krai had set up cameras near a birch tree over a period of a few weeks to see what activity they could record. 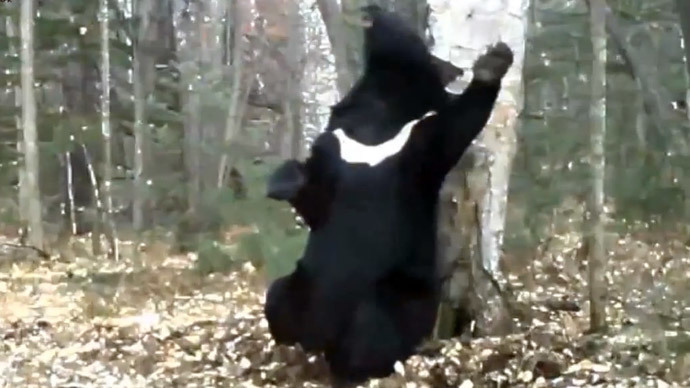 One Asian black bear, recognizable by the white blaze on its chest, took an instant liking to the tree and decided to relax and use it as a large scratching post. The image was caught on video and has now become a hit; with more than half-a-million views on YouTube. The nature reserve was founded in 1924 and over the last few decades it has been carrying out important research to try and support the local Amur leopard population.